These two famous Czech castles are about 30 kilometres apart. First, we visit Hluboká Castle, where we also have lunch. 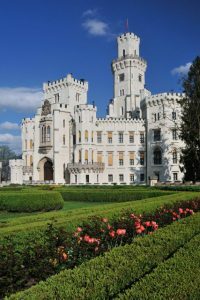 Then we travel to Červená Lhota, the most romantic chateau in the Czech Republic. On a rocky hill above a bend in the Vltava, arises the massive bulk of Hluboká Castle. Originally built in the 13th century, it was once the property of the Schwarzenberg Princes. The Castle is now a museum, with its more than 140 rooms and valuable collections of paintings, porcelain and glassware open to the public. 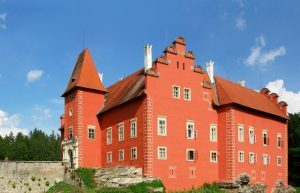 Červená Lhota Chateau is located on a small island in the middle of a lake. Every year, thousands of tourists arrive to admire its beauty, especially attracted by its romantic appearance. Its red walls are a popular feature in countless local fairy tales. In addition to a tour of the interior, there is also a boat trip on the Chateau pond to be enjoyed. One may walk around the entire Chateau on the shores of the pond, which affords stunning views of the whole four-wing structure.